H x W: 15 in. / 11 in. 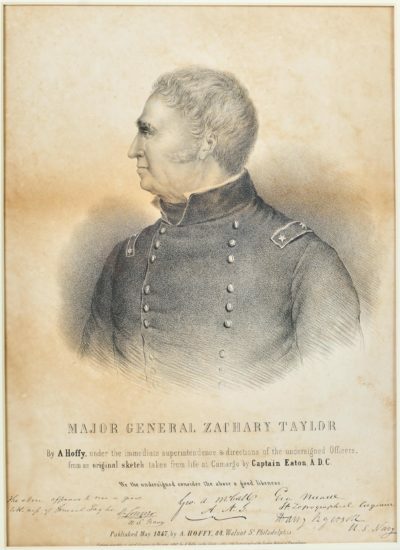 Zachary Taylor was the 12th President of the United States. Before his election as President, he was a career officer in the U.S. Army. Commissioned in 1808, he served as a Captain in the War of 1812 and entered the Black Hawk War as a Colonel in 1832. His reputation as a leader in the Second Seminole War earned him the nickname “Old Rough and Ready,” for his willingness to get his boots dirty alongside his men. His series of legendary victories in the Mexican-American War made him a national hero and catapulted him to the Presidency in 1848.